Join us as part of the National Medicare for All Week of Action, organized by National Nurses United & Our Revolution. Hundreds of events are happening across the country as activists come together to win Medicare for All! We’ll talk about what’s at stake, our plan to pass Medicare for All in the U.S. House, and what you can do to take action and get involved. This is a joint event for Congressional Districts 3 & 5, so it’s going to be extra fun, with all hands on deck! And featuring a performance from the Raging Grannies. Saturday, Jan. 26 12-2pm & 4-6pm: Street Canvass to Make Bernie 2020 a Reality! Click the link for more info, or contact Christopher at 971-288-3257. BerniePDX strongly opposes the Portland Public School Board’s decision to increase police presence in our public schools, and to spend $1.2 million of its limited funds per year on School Resource Officers (SROs). We call on the Portland City Council to refuse to confirm this decision. Police presence in schools threatens the education, lives, safety, and futures of students of color and others who are profiled by police. We must stop the school-to-prison pipeline and end racial disparities in conviction and incarceration rates; SROs are not the way to achieve this. 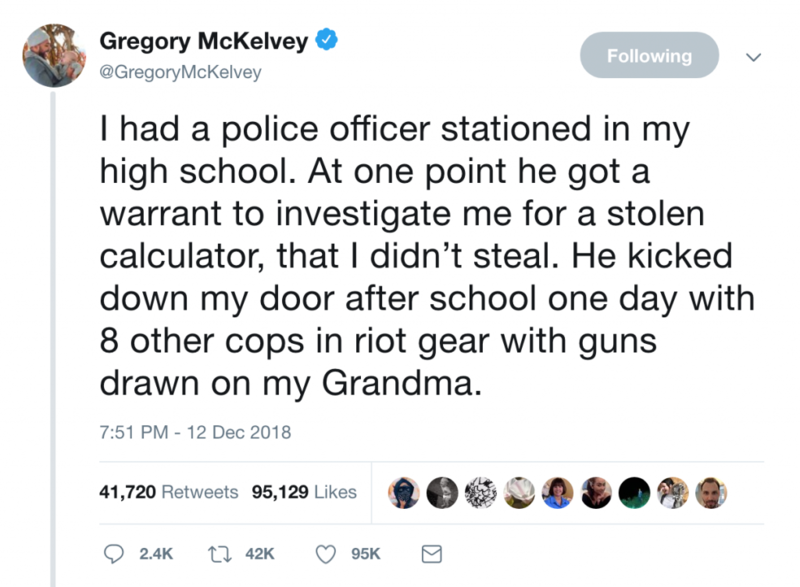 Research shows that SROs bring plenty of consequences for students, including intimidation on campus (as described here), and higher rates of suspension, expulsion, and arrest. School counselors and social workers will better and more safely help at-risk youth or youth in crisis. Despite Portland’s booming economy, our public schools are drastically underfunded. The school board should spend money on students and teachers, not police. BerniePDX will take this vote into account when considering future school board endorsements. We encourage all Portlanders to read this thread of a Portland Metro student’s experience with the SRO at his school. Join BerniePDX and supporters across the country for the Organizing for Bernie 2020 Livestream! We’ll discuss what we can do now to organize and lay the groundwork for Bernie’s potential run for president in 2020. Come out to demonstrate support for Bernie’s values, vision for our country, and his potential 2020 presidential run! We’re meeting at the yummy Italian sandwich shop, Shut Up and Eat, so bring your empty belly and your enthusiasm =). Livestream starts promptly at 1pm. ABOUT: Organizing for Bernie 2020 is a group of supporters and former campaign staffers working to recruit Senator Bernie Sanders as a presidential candidate in the 2020 Democratic Primary and lay the groundwork for a successful campaign operation. 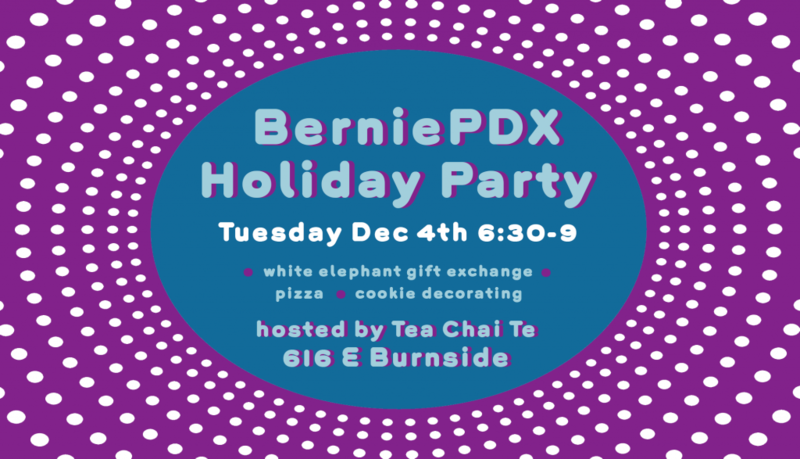 Tuesday, Dec. 4, 6:30-9pm: BerniePDX Holiday Party & White Elephant Gift Exchange! Start off winter right with your Bernie family at the BerniePDX Holiday Party and White Elephant Gift Exchange! All are welcome, and the event is kid-friendly. – A new or lightly used wrapped gift to swap–or steal! The November ballot is LONG this year! Come sip the best tea in town and textbank BerniePDXers to Get Out the Vote for all the great candidates and important initiatives on the ballot! Please bring your phone (or your laptop if you have texting capabilities on your computer). We’ll provide the text to send and the phone numbers. Help continue the Political Revolution by ensuring Bernie supporters turn out in droves for the 2018 election! 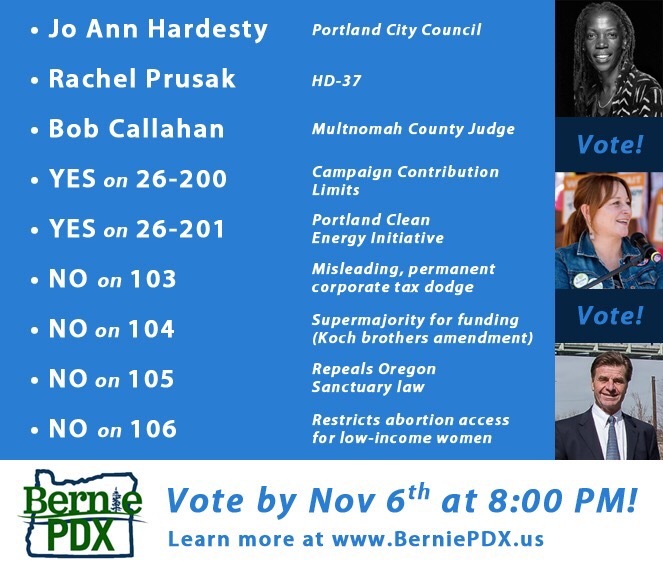 Note: BerniePDX did not have an endorsement vote for measures 26-199 & 102 (affordable housing) due to timing and capacity. However, many members have said they are voting yes. Saturday, October 6, 4-6pm: Election 2018 Forum: Let’s Bring It To Win It! We have lots of crucial ballot measures to consider in this year’s general election. Come learn about the good, the bad, and how you can help get out the vote. We will have canvassing materials, including lawn signs and voter guides. And yummy snacks! Let’s BRING IT to this election by campaigning to PASS the Good and DEFEAT the Bad.